The 23-year-old boyband hunk has been dating Coronation Street beauty Michelle Keegan, 25, since the end of 2010, but a picture has emerged in The Sun newspaper of a blonde girl with her arm around Max, planting a kiss on his lips. 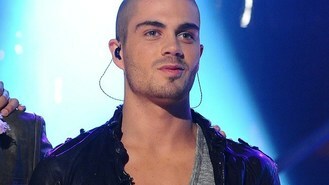 A spokesman for the singer said: "The Wanted have an incredibly passionate fan base. At times the fans can be over-eager when they meet them, especially in a club or bar environment. "In this case Max was approached and got slightly more than he bargained for." Michelle and Max called off their engagement in April because they said they were both too busy with work to organise a wedding. But Michelle told Fabulous magazine they were still "very much in love". She said: "We're not engaged any more, but not because we fell out or there was an argument. It was just there was no chance of us getting married any time soon because of our schedules. "He's away in America most of the time now and we just had a word about it. I'm a traditionalist so if I'm engaged, I want to get married and that's not happening soon."